A. The Barn: Naturally, this is where you keep your cows, horse, goats, and sheep. You can fit up to eight inside the barn. The silo is that round building right next to it. The silo is where fodder is stored, and you can access if from inside the barn. B. Tool Shed: This is where you store the tools you don't want to carry, things like the calf hatch, and there is also a cabinet to store things like flowers, records, and seeds. The milking room is built right in back of it. 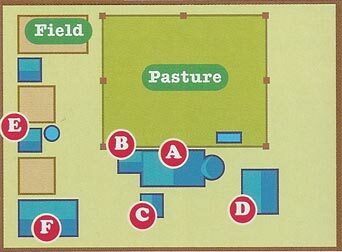 C. Food storage room: This is where you can ship items to town, order items and animals, and sell animals. You just put down what it is you want to do in the notebook, and Takakura will do it for you! There is also a large freezer inside where you can store milk, eggs, and produce. The production room is built right next to it. D. Takakura's house: Takakura's tiny cabin, this place never changes. The interior will only change once Tsurutan comes along. Takakura's house is one of the few places you can go into even when the owner of the home isn't inside. E. Chicken coop: This is where you keep chickens and ducks. A total of 8 birds can be kept inside. F. Your house: It starts off as a very small cabin, with only one room and not much decor... But as the game progresses, it gets bigger (and fancier), reaching its peak in chapter 4, with two bedrooms, a living room, and a kitchen. Not to mention a toilet room and bathroom.